How Do Dental Implants in Waco Differ from Dental Bridges? According to the American College of Prosthodontists, more than 36 million people have no teeth and 120 million people are missing at least one tooth. With these numbers in mind, it’s no surprise that more patients are asking their dentist which tooth replacement option is the most ideal. 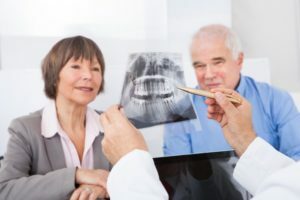 Both dental bridges and dental implants in Waco can replace missing teeth, helping you retain your bite and prevent teeth from shifting, but what are their real differences? Which is best for your case? Today, your dentist breaks them both down. While there are multiple types of bridges available, traditional dental bridges are the most popular and the most commonly provided option to date. When a tooth is missing, but natural teeth on either side of the gap are healthy, your dentist can create a restoration that sits on top of them with a pontic attached in between. The pontic, or fake tooth, effectively bridges the gap in your smile, helping you restore your bite, prevent neighboring teeth from shifting into the empty space, and improve your smile’s appearance. Keep in mind that your dentist will need to buff down enamel of your existing teeth to ensure the crowns fit securely. This will keep them in place during daily use. Of course, dental bridges require just as much daily care as natural teeth, especially since they will not last forever. On average, dental bridges can last between 10 and 15 years before needing replacement. Unlike bridges, dental implants are designed to go underneath the gums and integrate with your existing alveolar bone. This is possible because titanium, the material most commonly used in dental implants, is biocompatible. Because of this, the process known as osseointegration can take place. Once integrated, your implant should feel as natural as your existing teeth. Implants also replace the tooth root of teeth, allowing multiple functions to be restored. However, the healing process for implants is typically between three and six months, depending on where it was placed. It’s also a more expensive treatment upfront. Luckily, implants have the potential to last for life if properly cared for, and on average last about 25 to 30 years without issues. Of course, dental implants are far more expensive upfront due to all the materials needed to complete treatment. However, they are often seen as the most cost-effective solution to tooth replacement because of their durability and decades of average use. Not sure which option is right for you? Schedule a consultation with your dentist to see if a dental bridge in Waco or dental implant is your best option! Dr. Rick Cofer has over 200 hours of continuing education solely dedicated to implant dentistry. As a result, he’s helped hundreds of patients rebuild their smile with dental crowns, bridges, and implants. To learn more about his practice or about dental implants in Waco, contact him through his website. by: Dr. Rick Cofer at July 5, 2018 . Comments Off on How Do Dental Implants in Waco Differ from Dental Bridges?